I’ve been teasing you with pics of yellow felt circles for some time. This is what I was up to! This is actually a Pinspiration turned to reality post. 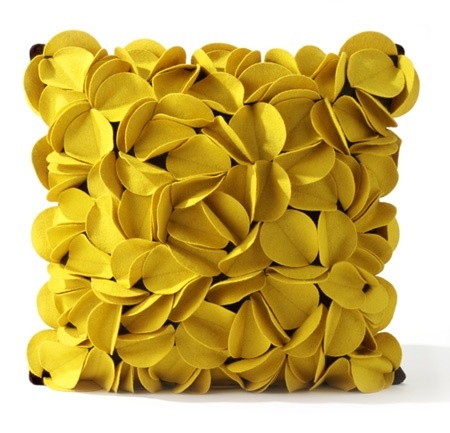 I saw this pillow on Pinterest and it was love at first sight. Sadly the House and Home article did not come with any instructions but I found 2 other adventurous ladies (Pressserfoot and Maybe Matilda) who had tackled this project. For the pillow I used a yard of yellow felt (as this is going to go in the basement bedroom where the accent color is yellow) from JoAnn, left over drop cloth from my zebra rug, and leftover white fabric from the ginkgo pillows. First up you need to decide how big you want your circles to be. The cap of a Pediasure bottle was the perfect size for me. As a side note, my 7 yr old is a very poor eater. So we still have Pediasure in the home at any given time. With a pencil I lightly traced circles on the felt and cut them out with regular scissors. I might have cut out around 150 circles. Yes, this is the most time consuming and mundane part of the project. Once I was done cutting I folded them in half and ironed it. My pillow was going to be a 12 x 16. So I traced a 12 x 16 rectangle again lightly with a pencil onto my drop cloth and started sewing the circles along the folded crease, one at a time. A really great tip that I got from the other bloggers who attempted this pillow was to start from the center. This is going to make your life easier as the circles get fuller and you move towards the corners. There is really no pattern for sewing them. Just stagger them around against each other making sure that they are not all in the same direction. Sometimes I would just get lazy and instead of sewing one at a time I would arrange a few in a string pattern and sew them all at a go. And then go back and fill in the gaps. You can see my not so trusty $20 Shark sewing machine in the shot. I so want to replace it with a good one. Maybe one day! Here is another shot of the same thing. You can see my pillow size outlines clearly in this one. For the back of the pillow I used left over white fabric from the ginkgo pillows. I made a regular envelope pillow ( you can get the detailed instructions here). The only difference is that since the height was only 12″ I used only 4″ of extra fabric instead of the usual 8″. Can’t wait to add her to the guest bedroom! What have you been up to? What are your plans for Thanksgiving? We are hosting family this year. So excited about it. Love the way the pillow turned out. I am going to try one of your pillows specially the NAMASTE one. Thanks Soumya. Do let me know how it goes. Lovely!! Admire your patience with cutting so many circles and then sewing them one by one. Have a quick question. How easy is it to use your sewing machine?? I have never used one (please don’t be shocked) but would like to get a non-expensive one for simple DIY projects. Ever since I saw your stencilled pillow, I have been itching to make one myself 🙂 and now this one has me drooling. Thanks Amu. If you plan on just regular sewing/hemming nothing major then you can use something like what I have. But if you plan on sewing slightly thicker fabric then I would go with a better one. For example for this pillow it was a bit tough filling in the spots in some places. This was my first felt project! And I’m in love too! Thanks Aimee. It sure is beautiful!! Love the color! Well done I love this. It must have take a long time but was well worth it. Thank you Lesley. OMG! That is a great tip. Don’t even know why I didn’t think of that. Will update the post too. i really love this pillow i also saw it on pinterest . i was just wondering how lond did it take you to make this ?? Thank you Eva. I did this over quite a few days. Actually months. Got really busy in between. Plus my $20 sewing machine was acting really weird most of the time. Once you cut out the circles maybe it will take you around 1-2 hrs (depending on your skill level) to sew them onto the fabric. The rest another 30 mins or so including cutting the fabric. Love, love, love this! I have so much felt left over from a baby quilt project (wasn’t sure how much I would need so I over-bought), this is a perfect use for it! Thanks for the tutorial. I have a circle cutter that is used for cutting fabric for quilting that I think will make fast work of this but I am not sure it can do more than one layer of felt at a time. I will let you know for future reference in case you want to make more of these (great for gifts). Wow looks awesome. Thanks for sharing. Would love to feature it in my next reader showcase post. Please let me know if that is ok. Yes, that is fine! Thank you Vidya! thanks for sharing your tutorial! i set a link and hope you agree. best wishes, doro von hand zu hand. Ooooh … I love this, Vidya!! Wow! That is gonna make this a lot easier. Thanks for the heads up Gwen. Will bookmark for future. This is sooo pretty Vidya! You did a beautiful job!! im so inlove with this pillow. Can i just use glue stick instead of sewing? Thank you. You could try gluing not sure how it will hold up when washing.